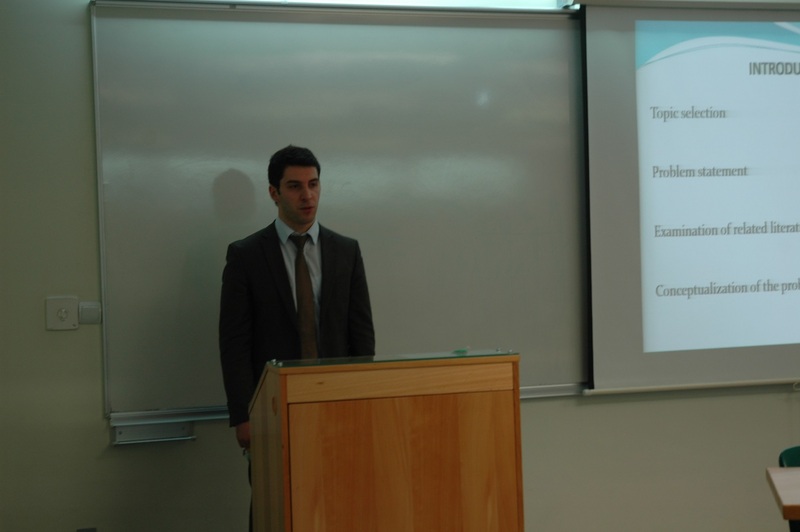 YEREVAN, Armenia – On February 16, 2015, the American University of Armenia (AUA) Political Science and International Affairs (PSIA) program hosted a seminar on ‘New Realities in the Middle East – “Islamic State,”’ with speaker David Manasyan, a Senior Research Fellow at the Institute for National Strategic Studies. The event was attended by PSIA faculty and graduate students and is part of a series of PSIA seminars that are held every Monday at 3:30 PM. Dr. Simon Clarke, Chair of the PSIA program, introduced the speaker. Manasyan presented his research, mainly focusing on the background, evolution, ideology and military capabilities of the Islamic state, as well as the challenges it presents to the world community and the region specifically. Manasyan emphasized the Islamic State of Iraq and Syria (ISIS) ideology that evolved around the restoration of Caliphate, Salafi – Jihadism, Wahhabism, anti-Shia orientation, as well as religious violence and terror. Close attention was paid to the importance of ISIS’ financial resources, such as taxation, exploitation of oil fields, criminal activities, and financial resources received from the Gulf States. For anti-ISIS groups, the challenge lies in the disintegration of Iraq and Syria, the Sunni – Arab center of gravity, the absence of ground forces in Syria, and foreign fighters’ recruitment and regional power competition. Manasyan concluded by discussing the necessity of cooperation between Iran and Saudi Arabia against ISIS.